Hiking is very popular in Catalonia: our first hiking club, the Centre Excursionista de Catalunya, was created in 1876 with the goal of organizing scientific and archaeological mountain hikes. And our land offers so many opportunities to hike and explore the countryside and its landscapes, for all levels of experience. When I was young I belonged to a Boys and Girls Scouts club, and we hiked and trekked all over our region. I treasure wonderful memories from those excursions! And while in our company we can only offer easy hikes of very low difficulty and close to the top tourist destinations, there are companies that specialize in mountain hikes and have specially trained guides that offer the level of security, skills and expertise that I’d require for my own family if I was traveling abroad. 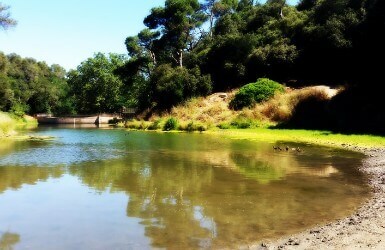 Let me share with you my favorite hikes in Catalonia! Let’s start with an easy option: the Collserola range is the northern limit of Barcelona, the city’s green lung and a natural park. There is a myriad of trails crossing it: from the scenic Carretera de les Aigües overlooking the city for over 6 miles (you can get there by taking the Tramvia Blau, then walk from the Funicular station), to the watery landscapes of Vallvidrera – a lovely reservoir where you often see ducks, water springs that invite to stop for a picnic… (take the FFCC trains from Plaça Catalunya to Peu del Funicular and follow the signs to the nearby information point to get oriented). But if you don’t feel like venturing on your own, there’s this company that organizes a cool hike from the well off town of Sant Cugat all the way back to Barcelona, crossing shady woods, stopping at old ermitages and springs, and of course, stopping to enjoy the views over Barcelona. The “camins de ronda” were coastal footpaths that connected the villages along the Costa Brava. They were very helpful if a fishermen boat sunk in front of the coast, so that the survivors could walk back to their hometowns. But they were also often used by smugglers dealing with tobacco and other expensive products since the 1800’s. Now these paths have been restored and make part of the GR 92 hiking trail, that goes along the cost from the border with France all the way down to the Ebre river covering the entire Catalan coast. There are itineraries for all levels, but the easiest is the one that takes you from Tamariu in Calella de Palafrugell to Palamós in 18km (11 miles). When asked on request, we can take you along a portion of it in our full day Costa Brava tour, or if you prefer the whole enchilada, this other company does the whole Tamariu-Palamós hike in 4 hours (plus the ride from Barcelona and back). The mountain range separating Spain from France offers wonderful hiking options. From exploring the lakes in the National Park of Sant Maurici, to climbing emblematic peaks such as the famous Pedraforca with its forked crest or the mythic Pica d’Estats with its over 10300 feet of high – the highest mountain in Catalonia, the Pyrenees are a paradise for nature lovers, and of course a place to find some of the top Catalonia hikes. In most cases, you’ll need your own means of transportation to reach most of these sites. However, there’s one that you can do easily on your own: the Núria Valley is connected with Barcelona via the RENFE line to Puigcerdà. Stop in Ribes de Freser, and then hop on the Cremallera rack train that will take you to the valley. There’s no road taking to Núria: it’s either the rack train… or hiking up! I’ve done this hike several times, but I must say I’m too lazy to walk it up: I usually take the train up, then hike down to Queralbs (might be harder on my knees, but it’s an easier cardio work). Once in the Valley, experienced hikers might want to climb another emblematic peak: the Puigmal. Or instead you can visit the Monastery or take some other easier trails that start there. This company also organizes hikes in the Núria Valley. You must be wandering: what? volcanoes in Catalonia? Yes! But don’t worry: the ones in la Garrotxa volcanic zone natural park they aren’t active anymore and haven’t been for centuries. However, their cones can still be clearly identified, and they create some unique landscapes and offer easy hiking opportunities for families. You’ll need to get there by car, though, or take the bus to Olot and then taxi to the natural park (make sure to ask the driver to pick you up at a later time). In high season the bus to Santa Pau also stops there. I recommend the walk around the beech tree forest (great foliage in Autumn! ), then connecting with the trails that go to the Croscat volcano (unique lunar landscape of what was once used as a mineral mine) and the Santa Margarida volcano, with a hermitage inside. SaveAND BONUS! Did you know that the St. James Path also has a Catalan branch? 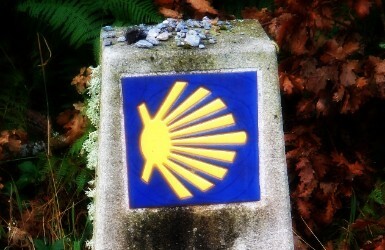 In the Middle Ages, the Camino de Santiago started where ever you lived as soon as you made the decision to pilgrim to Santiago de Compostela. So while now the Northern paths of the Saint James trail are the most famous ones, they weren’t really the only ones. Pilgrims arriving from the Mediterranean and the North of Africa would arrive to Catalonia by ship, then start cross Spain stopping at any relevant cathedral or monastery on their way. The paths they used have now been recovered and signposted, and while you won’t find as many hostels and services as you’ll find in the North of Spain, they are a wonderful way of going off the beaten path and explore the profound Catalonia – worth it even if you choose to just do a small section of it. One path starts near the French border in Port de la Selva with its Monastery of Sant Pere de Rodes, and takes you inland past Figueres, Girona, Vic, Manresa, Montserrat, and then on to the border with Aragon near Lleida. Another one starts in Tarragona and visits the Cistercian monasteries of Santes Creus, Poblet and Vallbona de les Monges before reaching the fruit tree fields of Lleida. 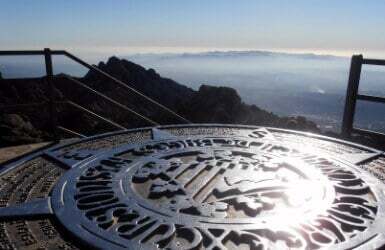 BTW, the path that connects Barcelona with Montserrat was a third option for pilgrims! So what about you? Head to the comments below and tells us: did you know there were so many hiking trails in Catalonia and what’s your favorite?